NASUGBU BATANGAS | People nowadays are always in search for a new destination; a place where they could relax, take lots of photos, and basically just to get away from their busy life in the metro. 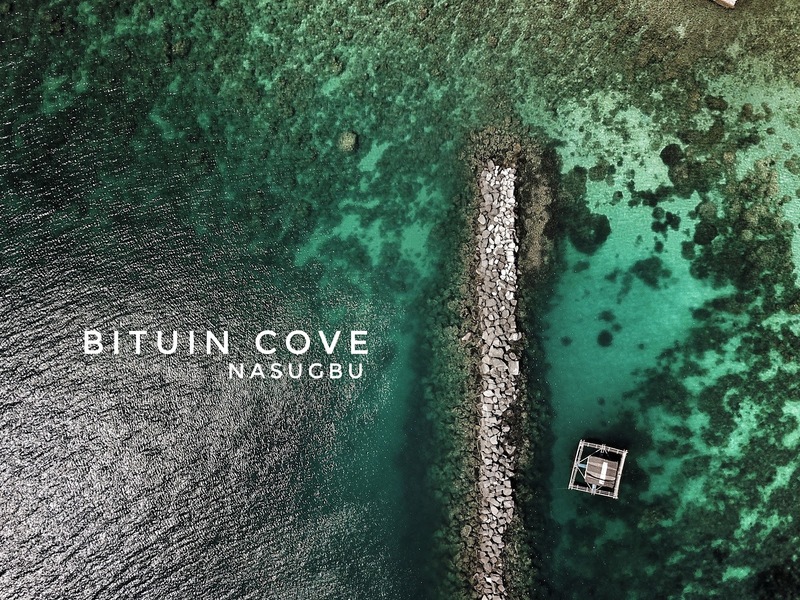 So, in search of a new destination, we heard about this new place in Nasugbu that is now becoming a new favorite beach destination, the BITUIN COVE. 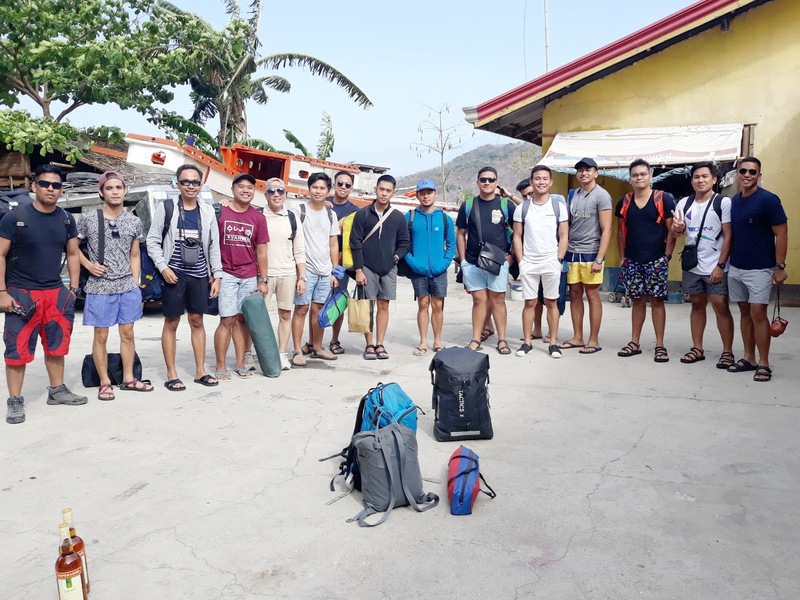 Once I arrived at a final date where I could go out again, I immediately contacted our Walwal Travel Group and told them that we were on for another beach camp. We all met at DLTB in Buendia from where we traveled to Nasugbu. The trip was nice and fast and when we arrived in Nasugbu, we hired a jeepney to Barangay Papaya in Nasugbu. It was a better alternative to tricycles, especially if you are traveling in a big group. Please make sure to constantly keep contact with Casiano. He could also organize a pick up for you in Nasugbu. If you have a car or on a motorbike, you can just waze it easily. Our contact person was Kuya Casiano. We arrived at his place and the boat was already waiting to take to take us to Bituin Cove. The boat ride took around 30 minutes from the Barangay Papaya to Bituin Beach. It was a scenic trip all the way and we couldn’t be happier with the great weather we had during our trip. We started getting a glimpse of the Bituin beach and we could already see that there were a lot of people in the cove. First thing I observed was how clear and calm the waters at Bituin cove were. For those asking if there is a phone signal at Bituin Beach, yes there is but it is very limited to some areas. When camping at Bituin beach, there are plenty of shady areas where you can pitch your tent. It’s better to arrive early so you have a choice where to pitch your tent. When beach camping, it is advisable to bring food and other utensils with you. I think you will save much by doing that. Otherwise, if you are craving for something they also have tuck shops where you can get coffee, noodles and other comfort foods. If we are going to talk about the beach, it is ok. The sand is white and is a mixture of rock coral and sand. But as mentioned, the calm water is really nice for swimming. Aside from swimming, we also enjoyed the sport of volleyball. Fortunately, Kuya Casiano, our guide rented out a volleyball net that we attached to the trees and immediately started the game! It was really fun and we also had a chance to play with other guests in the area. While others were resting, playing volleyball, I decided to go out for a swim and check out the underwater landscape and my goodness, it was amazing! 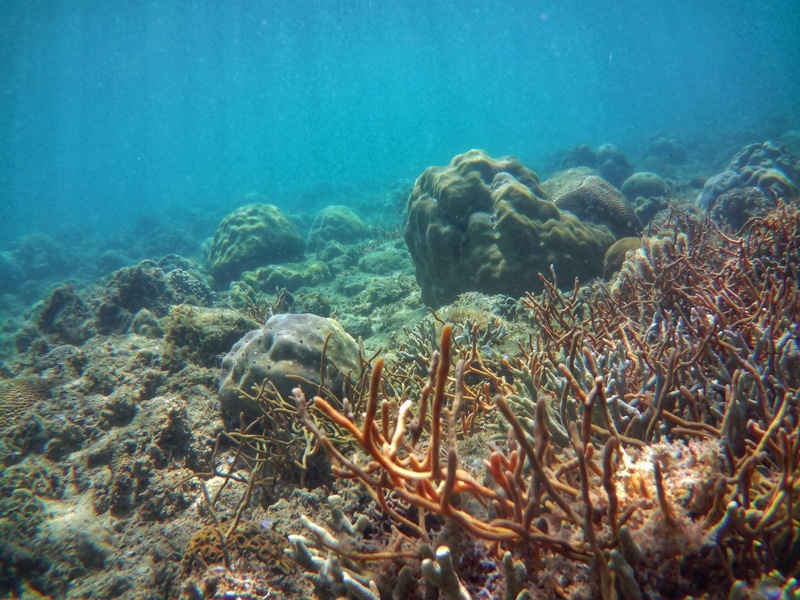 I never thought it was going to be that good and I hope the community could protect the corals because you can see some of them are still young but they are pristine! Be brave and jump from this pillar! It’s deep enough and if there is a place to snorkel in the area, this spot is the place to be. Another beautiful thing here at Bituin beach is the amazing sunset you see on this side of Nasugbu. It was a clear day and watching the sunset was really just beautiful. Taking photography to a different level, one of our friends, Jr Casco, brought his DJI Magic Pro drone and let it fly around the cove capturing some stunning images of this paradise. For those looking for water for general washing, there is a well that is found at the further end of the cove free of charge. * With regards to the food, we asked each of them to bring canned and other snack food that they can contribute. There were fish vendors in the area so we also bought some and had then grilled it for us. Before coming in, you may stop at the market in Nasugbu where you can buy condiments and other food that you can bring to your beach camp. All in all, we were very happy that we visited Bituin Beach. The place really is beautiful. We expected it to be very busy but that how it is anyway thinking that summer is getting closer. The water was crystal clear, it was clean, people were very friendly, snorkeling was excellent, so many things to do around, and most of all, this only cost us more or less Php 1000.00! Now that was a great deal! How many amazing places you can learn thanks to your blog, this is a real great opportunity for me and my friends. Hi. Thanks for the post. We're planning to go there this weekend. May snorkeling gears for rent ba in the area? Hi i would to ask how much did you spent for the water activities? Thank you. Water activities are free! The corals are amazing and few walks away from the camping sites. Hello! If ever po ba dalawa lng kami, pwde po ba makiJoin sa bigger group para less ung bayad nmin sa bangka? It really was! I was surprised as well! Hi Kua! Ask ko lng if allowed mgbonfire? Hi Just want to ask if may cliff po doon or anything for diving po?. Yes meron po cliff dun for diving. Ingat lang po sa mga corals baka makasugat po. Hello po Ask ko lang po kung meron paring boat kahit December 31…?? ?